When you choose HyperOIS as your Hosting Services provider you can be well assured that you are being serviced by name brand High Performance Industrial Grade Server Hardware from DELL, SuperMicro and Intel, a network powered by Cisco Hardware and a state of the art Data Center. We carry tremendous amount of experience when it come to Internet Servers, Networks and related systems. One of the biggest advantages you gain when you subscribe to our managed hosting services is 'scalability on demand'. We strive to understand our customer's current business and historical growth pattern. Collectively we plan ahead to expand our network bandwidth and infrastructure to meet our customer's upcoming needs. This will allow us to quickly accommodate our customers when they need more bandwidth or faster or higher capacity server hardware. Our network is designed to be fully redundant and self healing from top to bottom. The only possible single point of failure is the connection to the physical server which limits any risk to a single rack or a single server. Each Foundry FESX-448-PREM access switch dual uplinks to a Foundry FESX-424-PREM allowing for local layer 3 switching, policy assignment and egress DoS protection. 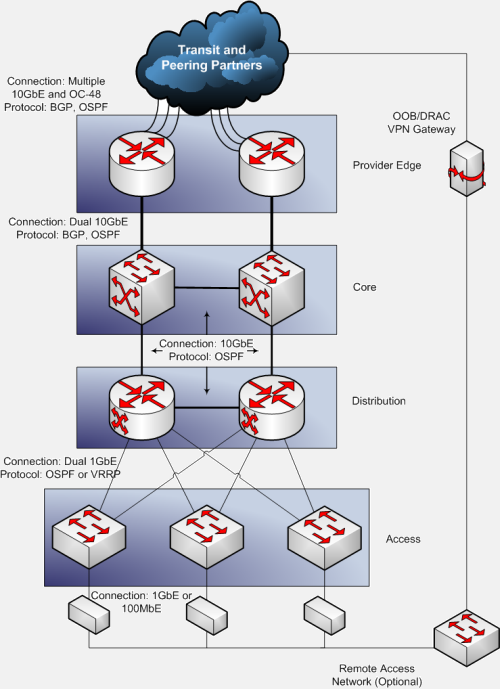 The FESX provides redundant service by utilizing OSPF or VRRP ensuring that both layer 2 and layer 3 traffic has an alternate path in the event of a failure. Each FESX connects via 10GbE to sets of Foundry BI-RX-8's which act as layer 3 aggregation routers. 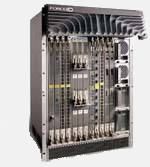 In addition to the direct connections to the BI-RX's, each FESX connects to its hot-spare through a dedicated 10GbE connection ensuring that in the event of a physical network cable/fiber cut the device does not need to degrade its master status and can continue passing traffic through its hot spare, thus limiting the amount of automated actions taking place in the event of a minor failure. The BI-RX-8's in turn connect to Force10 E600's via 10GbE. The E600's provide redundant 10GbE connectivity to our transit providers and also interface with multiple Juniper M20's which peer with other providers via redundant OC-48 connections providing a maximum throughput of ~35Gbps. The E600's and the M20's communicate internally via iBGP allowing for extensive route mapping and traffic shaping helping us to provide you with the fastest connections and least latent path possible. The entire datacenter building is a secure, controlled access facility with 24x7x365 manned Security. The facility is secured with Card Key Access System, 24-hour Video Monitoring System with cameras installed in key locations to cover all accessible data center floor space. In addition to the floor access security, all server hardware is locked in a highly secure steel cages.. The entire Data Center floor has Industrial grade, redundant 30 Ton Liebert HVAC system with zone based temperature monitoring and an micro particle air filtration system. The power system in the Data Center provides industrial grade, conditioned, multi-grid, redundant power, designed to run the entire data center without interruption. The Datacenter is powered by two independent Power Grids, separate redundant UPS Systems for each power grid, and separate Diesel generators for secondary backup. In case of a power outage, the generators can power the entire datacenter for up to 24 hours with the fuel onsite.